﻿Сценарий урока в 6-м классе: "Welcome to London!" Сценарий урока в 6-м классе: "Welcome to London!" 1. Овладение учащимися произношением, лексикой и интонационной окрашенностью иноязычной речи. 2. Развитие речевого умения в диалогической форме, развитие умения аудировать с детальным пониманием. Воспитательные: Воспитание уважительного отношения к другой культуре, более глубокое осознание своей культуры через контекст культуры англоязычных стран. Развивающие:Развитие познавательного интереса учащихся, развитие оперативной памяти, и концентрации внимания. – ТСО: магнитофон, мультимедийный проектор, компьютеры;. Учитель: Good morning . How are you, Dima? Ученик : I’m fine, thanks, and you? Учитель объявляет цели урока . 3. Погружение в иноязычную речь. 3.1 So, dear friends, today we are going to visit London. But first we must be ready for our trip properly. That’s why let’s revise everything we know about London. What sights do you know? 3.2. Затем учащиеся проводят стрелки от этих названий к картинкам, расположенным на доске. London has also many parks and gardens. It’s the best known It is a very democratic park. In the park anyone can stand up and say what they want. Hyde Park . I say, Ronald. I’m going to London one of these days. You don’t say so! How long are you going to stay there? I must tell you that there are many places of interest in the capital of Great Britain. What do you advise me to begin with? The Houses of Parliament, Trafalgar Square, Westminster Abbey and Buckingham Palace are a must. People who come to London always go to those places of interest. Is Buckingham Palace the residence of the Queen? Sure. If the flag is flying on the top the Queen is at home. If you are interested in architecture you should see St. Paul’s Cathedral and the Tower. Are they in the centre of London? Yes they are. No doubt they are worth seeing. And don’t forget to go to London Parks. They are wonderful. I’ll follow your advice. Thank you for the information. 5. Активизация языкового материала – Представление учащимися проекта «Экскурсия по Лондону» (с использованием мультимедийного проектора – компьютерная презентация “ Welcome to London ”). Guide : Ladies and gentlemen! We welcome you to London. Let us introduce ourselves to you. My name is Mary Brown and my colleague’s name is Jane Smith. We are your guides. 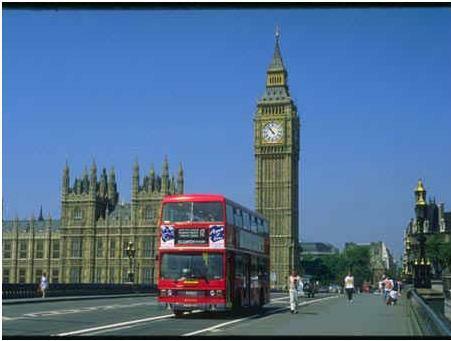 Your first day in the city starts with London Sightseeing Tour which we will make on the red double-decker bus. Let’s start our tour. London is the capital of Great Britain and Northern Ireland. It’s one of the biggest cities in the world. London is situated on the river Thames. About 7 million people live here. The city is more than 2 thousand years old. Tourist 1: I know some interesting facts about London too. Tourist 1: Oh no, not really. Guide : Yes, you do, you really do. Tourist 1: Thanks a lot. You’re very kind. Guide : Well, London’s history began with Romans who made Londinium the centre of the province. London was an important city in Roman times. Like all big cities, London is a cosmopolitan city. People of all nationalities live here. So, we’ll start our tour with Buckingham Palace. Tourist 2: Look, the flag is flying on the top, the Queen is at home. But what about Buckingham Palace? Guide: It’s a symbol of the British monarchy. It was built in the 18 th century but now it is the home of the English Queen Elizabeth II. Now we are crossing the River Thames, from here you can see the Tower of London. Tourist 3: Where, where is it? Is this the tower built by William the Conqueror to impress and frighten the English? Guide: Yes, there are many buildings here but the most important is the White Tower., which is the oldest one. There’s also a Jewel House which contains the famous Crown Jewels. Tourist 3: They say, there’s a legend about ravens which protect London. What is it like? Guide: It says that without ravens the Tower will fall. Guide: Now look at this magnificent cathedral. Do you know its name? Tourist 4: It’s St. Paul’s Cathedral. Its architect is Sir Christopher Wren. Inside the dome is the Whispering gallery. If you whisper close to the wall on one side of the dome, you can be heard on the other side. Tourist 2 ….. the seat of the British Government. It has two Houses: the House of Lords and the House of Commons. And this is Big Ben. Guide: The clock has two faces and a very loud bell. The bell weighs 13 tons. The man in charge was Sir Benjamin Hall. This man was very tall and his friends called him Big Ben. So they called the bell Big Ben, too. Now Trafalgar Square is straight ahead. In the center of it you can see the statue of Admiral Nelson who defeated the French at the battle of Trafalgar in 1805. I see you are a bit tired. It’s a pity! But our London sightseeing tour is over for today. But what sights would you like to see tomorrow? Of course, Westminster Abbey where many famous people are buried. Tourist 2 It won’t be bad to see London parks which are so much spoken about. Guide: All right, tomorrow you will see all these places and what not. Have a nice evening. Good bye ! 6. Повторение темы « Еда». Mm mm. That sounds good. I think I’ll have the same. Chicken soup. That sounds good. 6.2 It’s time to have a bite and go to a cafe. Работа в парах – диалог ‘At a Cafe – учащиеся составляют свои диалоги, используя фразы из “A Small Talk ”. What sight of London is it? The official residence of the Queen. The seat of the Government. The second largest cathedral in Europe. One of the largest museums in world with the famous exhibits from prehistoric time to nowadays. A geographical centre of London. A fine collection of European paintings. The largest clock in Great Britain. In this park anyone can stand up and say what he wants. From here one can see the Tower of London. Выполнить упражнение № 6 (на листочках): Вставить недостающие реплики в диалог и выучить его. Did you enjoy your trip? Did you visit Buckingham Palace? Where have you been? How lucky you are .... has got many parks. .......took a lot of pictures. With pleasure. Why, if it isn’t, Olga! Glad to see you! Oh, hello, Ann. Glad to see you too. To London. I came back only yesterday. You don’t say so!.(2)................... Did you go to London alone? Of course not. I went there with a group of Russian students. Oh, it was fantastic. I saw and learned much about the capital of Great Britain. I saw a lot of places – Trafalgar Square, the Houses of Parliament with its Clock Tower and Big Ben and what not. Sure. The home of the Queen is wonderful. I know London. (5).................... Is it true? (6)................... in London. Come to my place. I’ll show you everything.